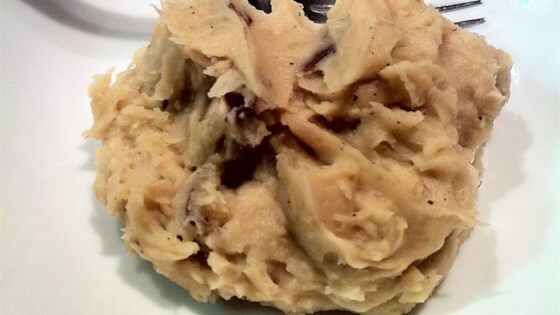 "If you love garlic and you love mashed potatoes, you're sure to love these! You can peel the potato skins off if you prefer." Place the potatoes, water, and butter into a slow cooker. Season with salt, garlic powder, and pepper. Cover, and cook on Low for 7 hours, or High for 4 hours. Mash potatoes with a masher or electric beater, adding the desired amount of milk to achieve a creamy consistency. Keep warm on low until serving. Super easy and absolutely wonderful! I increase the recipe to use 5 lbs of red potatoes. It is the perfect amount for Thanksgiving with my family. Excellent. Much denser than traditional mashed potatoes. I added several crushed whole cloves of fresh garlic which then got mashed into the potatoes.